Ever since Toyota opened its first manufacturing plant in the U.S. in the early 1980s, foreign manufacturers have been growing their factory presence here. Today, more “foreign” cars are made in America, such as Korean companies Kia and Hyundai; German companies Volkswagen, BMW, and Mercedes-Benz; and the two other major Japanese companies, Honda and Nissan. And if you want to split hairs, add Italy’s Fiat, current corporate parent of Chrysler. Making your products close to the customers who buy them saves time and money along the supply chain. “Eighty-five percent of Nissan products sold in America will be made in America by 2016,” Nissan spokesperson Travis Parman told me recently. Most of them are being built at the Nissan plant in Smyrna, Tenn., one of the busiest auto manufacturing plants in the U.S., with more than 334,000 vehicles rolling off its assembly lines in 2014. Nissan has invested nearly $6 billion in the Smyrna plant, which has a workforce of more than 8,000 and an annual payroll of just under $300 million. It produces the Altima and Maxima sedans, Pathfinder truck, Rogue crossover, and Leaf electric car, as well as the Infiniti QX60 and the engines for those models. Nissan also moved production of the Murano from Japan to Canton, Miss., last year. The Smyrna factory also is the world’s largest production facility for lithium ion batteries, used to power the Nissan Leaf EV and Nissan and Infiniti hybrid vehicles. Engineers also are researching other uses for the batteries, including as emergency power in a power failure. John Martin, Nissan’s top executive for manufacturing and supply chain management, told me a fully charged Leaf battery can power an average home for three days, and can be repurposed to power medical devices in hospitals or at home, such as motorized wheelchairs. VW’s huge plant in Chattanooga, Tenn., is the world’s first auto manufacturing facility designed and constructed to be LEED certified. The $1-billion factory, which builds the Passat, opened in 2011 and is powered in large part by a huge solar installation that produces more than 13 million kilowatt-hours of green power a year. BMW produces the X3 and X4 utility vehicles in Spartanburg, S.C. The plant has more than 8,000 employees and the capacity to build more than 300,000 vehicles a year, half or more for export. BMW also has purchased carbon-fiber manufacturer SGL Group, based in Moses Lake, Wash., to supply the lightweight, high-tech material for the award-winning i3 and i8 electric cars assembled in Europe. 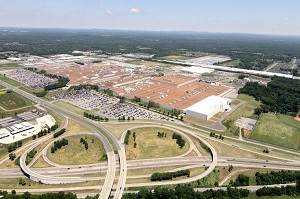 Mercedes-Benz produces most of its SUVs in Tuscaloosa, Ala., including the M-Class and GL-Class, plus some models of the C-Class. Honda has produced more than 20 million cars in the U.S. in the last 30 years. Half of them are the best-selling Accord, including the Accord Hybrid. Honda has factories in Ohio, Alabama, and Indiana producing 11 models, including the next-generation Acura NSX sportscar. That first Toyota factory in the U.S., in Georgetown, Ky., produces the Camry, Camry Hybrid, Avalon, Avalon Hybrid, and Venza, and Lexus ES 350, plus four-cylinder and V-6 engines. Toyota also has factories in Indiana, Texas, and West Virginia, where the Sienna and Tundra are manufactured. All together, Toyota’s 14 North American plants, including in Mexico and Canada, produce seven out of every 10 vehicles sold in the U.S. Additional vehicles built here are exported to 23 countries around the world. 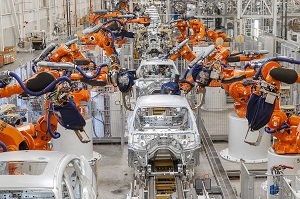 Hyundai produces the popular Sonata family sedan and Elantra compact in Montgomery, Ala., most of which are sold in the U.S. Corporate sibling Kia produces the Sorento and other models in West Point, Ga. Each of the two factories has a capacity to build 300,000 vehicles a year. The only major foreign car companies not producing vehicles in the U.S. are Porsche and Audi. But I’m betting that will change soon. 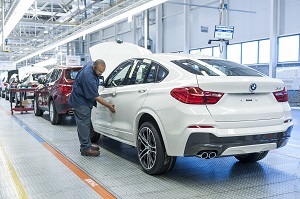 Manufacturer Photo: BMW produces the X3 and X4 utility vehicles in Spartanburg, S.C. The plant has the capacity to build more than 300,000 vehicles a year. Nissan’s Smyrna, Tenn., manufacturing plant has a workforce of more than 8,000 and a payroll of just under $300 million. This entry was posted in Down the Road, Rely on the Auto Experts -- Motor Matters Reviews. Bookmark the permalink.